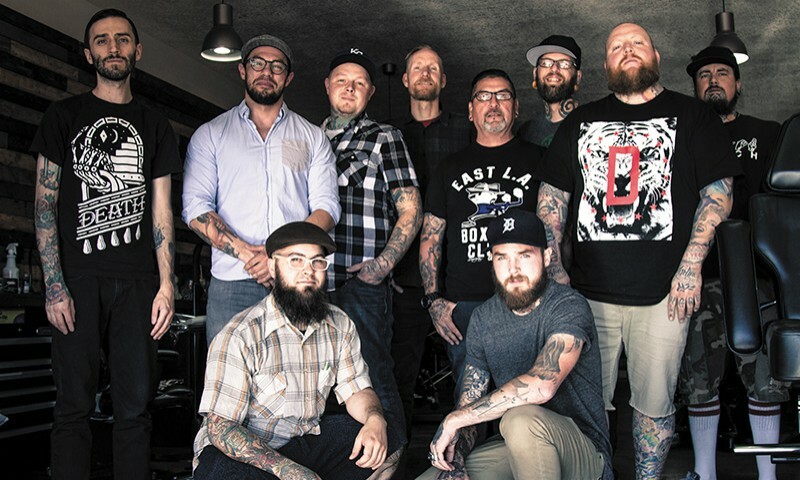 When it comes to tattooing the community, GoodTimes Tattoo has not only been around for 15 years—making it one of Salt Lake’s more seasoned tattoo shops—but it has also continually produced high-quality tattoos throughout its existence. With a brand-new location on 1249 S. 900 E., the folks at GoodTimes are hoping to continue to provide great tattoos to Salt Lakers and beyond. Passion and a multifaceted approach are reccurring themes that are visible in each member of the shop. They take pride in dedicating themselves to each tattoo that they do, regardless of style. “I do think that is one of the things from GoodTimes that people, hopefully, have come to know: the shop as a place that they can get a little bit of any style,” says Burleson. Committed to versatility, the artists are always looking for opportunities to try new ideas and work with complicated concepts. “When someone asks us, ‘Which artist would be good for this?’ it’s super hard because we’d all be disappointed to miss out on an opportunity to do a killer tattoo,” says Hinton. Part of what has allowed GoodTimes’ continued growth is their conscious effort to stay current in the industry. “We’ve seen tattooing evolve and progress,” says Burleson. “The tattooing atmosphere and the tattoo scenes in Utah are really good. There are a lot of really talented people here doing tattoos, and it’s elevated the overall tattoo culture in Utah. We’ve been able to stay current and continue to work on our craft. It’s a never-ending process” In fact, the artists strive to continually better themselves, which allows them to grow as artists and as people. “The day that I don’t care or the day that I stop improving or being thirsty for knowledge is the day that I stop tattooing—because at that point, I can no longer see a point in doing it,” says Burleson. The guys at GoodTimes constantly strive to be the best that they can be, and they remain open to inspiration from the outside world and clients alike. The general consensus seemed to be that the best source for inspiration and creativity was from each other. “The guys I work with inspire me daily, and I’ve been doing this for 20 years. They probably have as much influence over me as anybody,” says Burleson. The move from their previous Downtown location—one that they had resided in for over 10 years—to the Sugarhouse area has been a major move on their part in regard to growing their business. With such a big move comes an even bigger sense of motivation and urge to excel within their craft. “We all work so hard,” says Hinton. “That’s what keeps our shop moving. We’ve got a lot of self-motivated people here, and everyone aspires to be the best they can be. That’s one of the things that really makes our shop special.” It is this dedication to the art and to their clients that has allowed GoodTimes to prosper for such a long time—they have weathered an unpredictable economy and a well-saturated industry, all while increasing their already expansive knowledge of the industry and simultaneously giving life to their clients’ ideas. “We all really love tattooing, and we all want to see the best in it, and that’s what’s so awesome about our shop. When we love it, our clients know we love it, and they want to love it too,” says Hinton. The new location offers the guys at GoodTimes the opportunity to connect not only with their clientele, but also with surrounding local businesses. “We’re next to businesses that we’ve supported for a really long time. We don’t do piercings, and Koi doesn’t do tattoos, so it’s been really great,” says Hinton. The outside of the shop includes a community bulletin board where citizens can post flyers or other information about local events. At the end of the day, the fellas at GoodTimes just love their clients as well as the opportunity to make visions come to life and treat each tattoo as a chance to learn more about their trade. Be sure to check out the shop’s Instagram, @goodtimes_tattoo, or stop by their new location in Sugarhouse. 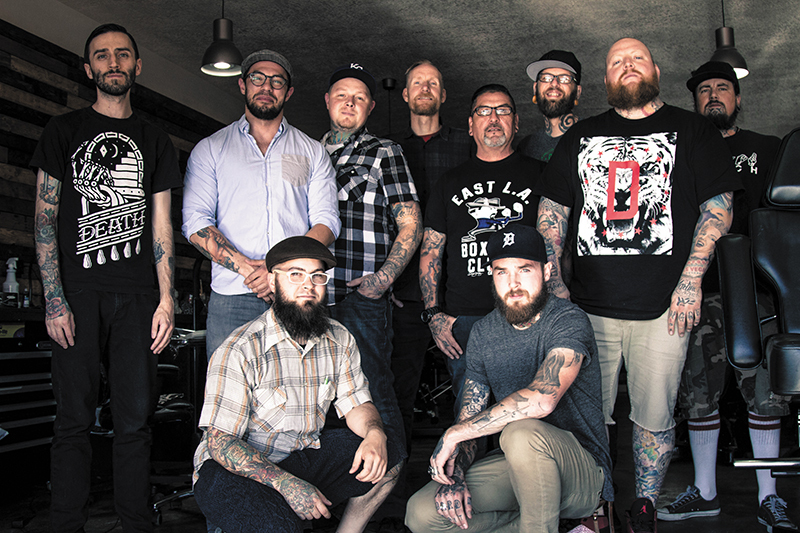 They will have an open house on July 19—it starts at noon and goes all day—to celebrate their 15 years of tattooing Salt Lake City.